In the center of the Milky Way: the background image shows the dust emission in a combination of data obtained with the APEX telescope and the Planck space observatory at a wavelength around 860 micrometers. The organic molecule iso-propyl cyanide with a branched carbon backbone (i-C3H7CN, left) as well as its straight-chain isomer normal-propyl cyanide (n-C3H7CN, right) were both detected with the Atacama Large Millimeter/submillimeter Array in the star-forming region Sgr B2, about 300 light years away from the Galactic center Sgr A*. A team of astronomers has detected the presence of iso-propyl cyanide in interstellar space, opening a new frontier in the chemistry of star formation. There is large number of organic molecules in space. One of which, iso-propyl cyanide (i-C3H7CN), was now discovered by scientists in a giant gas cloud called Sagittarius B2, a region of intensive star formation close to the center of our Milky Way. The branched structure of the carbon atoms within the iso-propyl cyanide molecule is unlike any other molecules that have been detected so far in interstellar space. This discovery opens a new frontier in the chemistry of regions of star formation, and indicates the presence of amino acids, for which this branched structure is a key characteristic. While various types of molecules have been detected in space, the kind of hydrogen-rich, carbon-bearing (organic) molecules that are most closely related to the ones necessary for life on Earth appear to be most plentiful in the gas clouds from which new stars are being formed. “Understanding the production of organic material at the early stages of star formation is critical to piecing together the gradual progression from simple molecules to potentially life-bearing chemistry,” says Arnaud Belloche from the Max Planck Institute for Radio Astronomy, the lead author of the paper. The search for molecules in interstellar space began in the 1960’s, and around 180 different molecular species have been discovered so far. Each type of molecule emits light at particular wavelengths, in its own characteristic pattern, or spectrum, acting like a fingerprint that allows it to be detected in space using radio telescopes. Until now, the organic molecules discovered in star-forming regions have shared one major structural characteristic: they each consist of a “backbone” of carbon atoms that are arranged in a single and more or less straight chain. The new molecule discovered by the team, iso-propyl cyanide, is unique in that its underlying carbon structure branches off in a separate strand. “This is the first ever interstellar detection of a molecule with a branched carbon backbone,” says Holger Müller, a spectroscopist at the University of Cologne and co-author on the paper, who measured the spectral fingerprint of the molecule in the laboratory, allowing it to be detected in space. But it is not just the structure of the molecule that surprised the team – it is also plentiful, at almost half the abundance of its straight-chain sister molecule, normal-propyl cyanide (n-C3H7CN), which the team had already detected using the single-dish radio telescope of the Institut de Radioastronomie Millimétrique (IRAM) a few years ago. 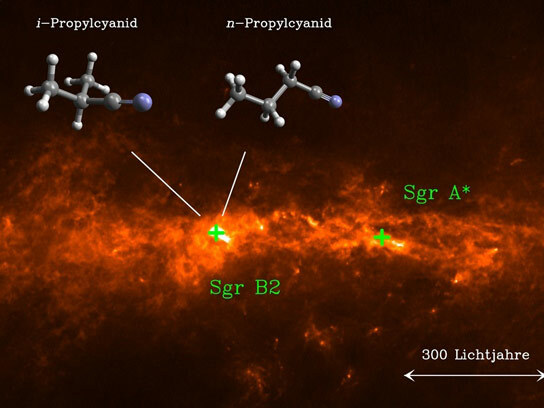 “The enormous abundance of iso-propyl cyanide suggests that branched molecules may in fact be the rule, rather than the exception, in the interstellar medium,” says Robin Garrod, an astrochemist at Cornell University and a co-author of the paper. The team used the Atacama Large Millimeter/submillimeter Array (ALMA), in Chile, to probe the molecular content of the star-forming region Sagittarius B2 (Sgr B2). This region is located close to the Galactic Center, at a distance of about 27,000 light years from the Sun, and is uniquely rich in emission from complex interstellar organic molecules. “Thanks to the new capabilities offered by ALMA, we were able to perform a full spectral survey toward Sgr B2 at wavelengths between 2.7 and 3.6 mm, with sensitivity and spatial resolution ten times greater than our previous survey,” explains Belloche. “But this took only a tenth of the time.” The team used this spectral survey to search systematically for the fingerprints of new interstellar molecules. “By employing predictions from the Cologne Database for Molecular Spectroscopy, we could identify emission features from both varieties of propyl cyanide,” says Müller. As many as 50 individual features for i-propyl cyanide and even 120 for n-propyl cyanide were unambiguously identified in the ALMA spectrum of Sgr B2. The two molecules, each consisting of 12 atoms, are also the joint-largest molecules yet detected in any star-forming region. The team constructed computational models that simulate the chemistry of formation of the molecules detected in Sgr B2. In common with many other complex organics, both forms of propyl cyanide were found to be efficiently formed on the surfaces of interstellar dust grains. “But,” says Garrod, “the models indicate that for molecules large enough to produce branched side-chain structure, these may be the prevalent forms. The detection of the next member of the alkyl cyanide series, n-butyl cyanide (n-C4H9CN), and its three branched isomers would allow us to test this idea”. “The detection of iso-propyl cyanide tells us that amino acids could indeed be present in the interstellar medium because the side-chain structure is a key characteristic of these molecules”, says Karl Menten, director at MPIfR and head of its Millimeter and Submillimeter Astronomy research department. “Amino acids have already been identified in meteorites and we hope to detect them in the interstellar medium in the future”, he concludes. 1 Comment on "Astronomers Detect Iso-Propyl Cyanide Close to the Galactic Center"
Hydrogen is the primordial element in space. Then Oxygen, Nitrogen and Carbon are the elements formed in the space only which is obvious when we see the structure of comets which are from a far space in any stellar system. The combination of these elements into water(H2O) (which is prevalent in Moon, Mars or any planet), Carbon-di-oxide (CO2), Methane (CH4),Ammonia (NH3) and all other organic chemistry molecules happen only in space which are then carried on to the planets in formation. Space is having a such a high radioactivity, that any synthesis is possible. This article brings out this truth clearly. So,Precursors of life are formed in the space rather than the planets where it is nurtured. But the big problem is communication between two stellar systems which is mathematically not possible since the phase of formation of living beings are separate in either stellar system and they are with such a gap that simultaneous logging on is impossible, which is worsened by the fact that light travels in such a slow….?? speed of 3X10^8 meters per second compared to the vastness of this universe where this speed is trivial. Thank You.